We are waste carriers and have removed waste from Hospitals, Council houses, residential property, commercial and business premises. Our Fees consist of two removal chaps who come and collect your waste and dispose of it in an environmentally friendly and ethical way. 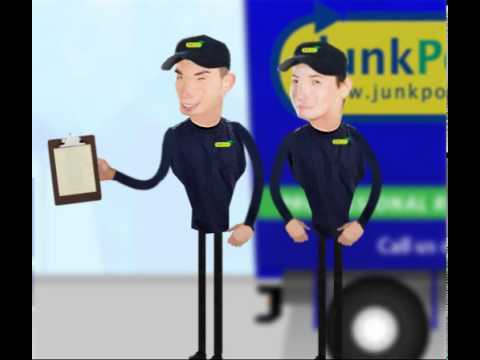 Included in our range of junk removal services is paper shredding, house clearance, office clearance, garden clearance, junk removal, rubbish removal, and general waste disposal, we don't do skips, but are an alternative to skip hire! Q) What Type of junk do you haul away? Q) Are You Licensed & insured? A) We are Fully Licensed with the environmental agency and fully insured to carry out the work. Q) Why do you book customers in? A) To allow for unforeseen circumstances, such as traffic or jobs that end up being larger than expected, appointments are booked in two-hour slots. The Junk Porters team will call you 15 to 30 minutes before arrival. Q) Why do you have a kangaroo on your Logo ? A) The kangaroo is fast and so are our Junk team they skip in and out clearing the junk in record time, so customers are not left waiting around. Q) Do we require a Permit? A) The benefit of Junk Porters Is that you do not require a Permit. Q) Do you sweep up afterwards? A)Once the rubbish is removed the Junk Porters team Sweep up. If they don't you can report it to us and we will tell their mums. Q) What do you do with the Rubbish Removed? A) Once the rubbish is removed we try to recycle and reuse as much as possible. We donate most items to charities.